I ran into Estaban this weekend while walking over the Michigan Avenue bridge downtown. 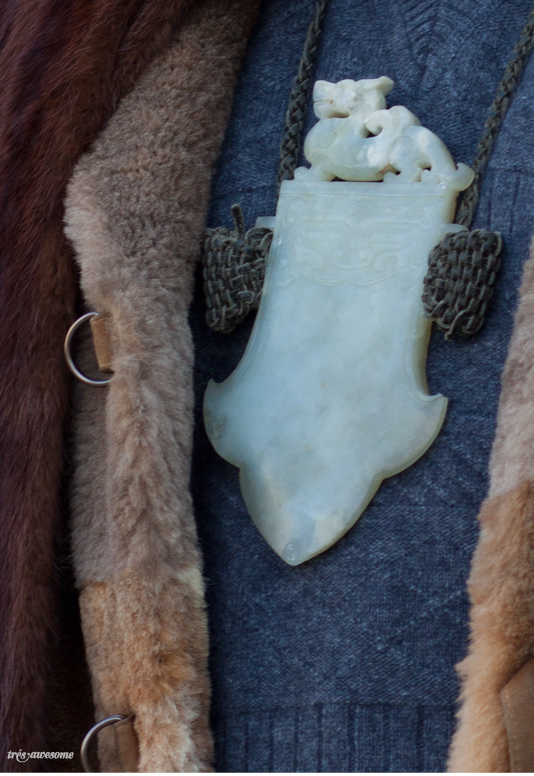 He was hard to miss in his huge shearling fur coat, mink stole, and enormous jade amulet. 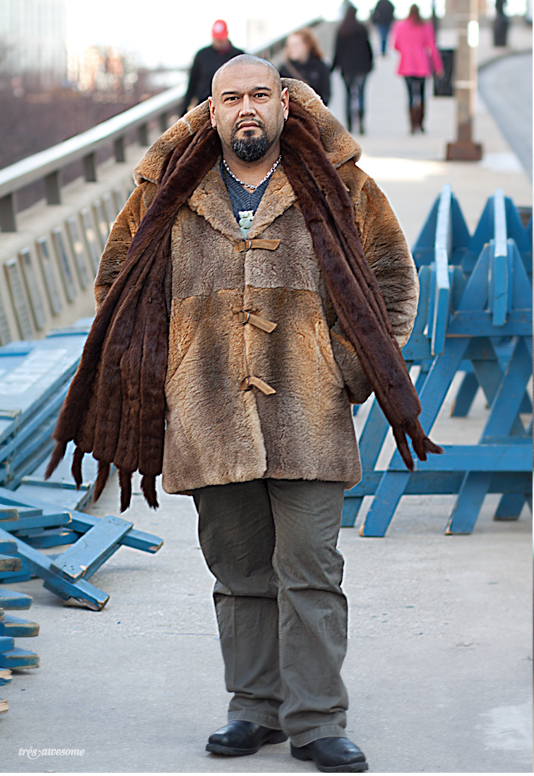 When I was taking his photo he asked me if I wanted him to unbutton his coat. I replied, "no just keep it the way you have it", not knowing the literal treasure he was wearing underneath. This is without a doubt the most unique object I've ever photographed on someone. Apparently it's a Chinese antiquity that Estaban was given as a gift. It certainly looks like one. I love that he's just wearing it for a casual stroll around downtown Chicago. Let's have a closer look at this gem, shall we? The scale alone is remarkable and the woven leather pouches on either side are just beautiful. Thank you Estaban, you have truly made my millennium. 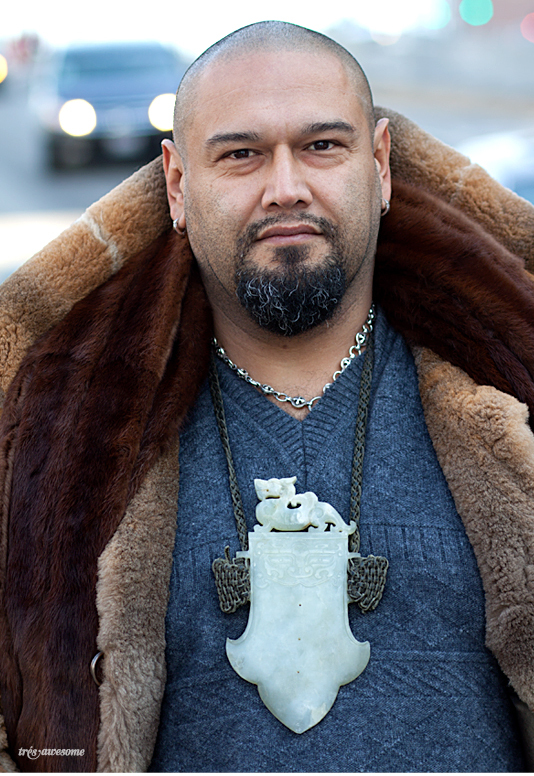 This Chicago street style fashion was captured downtown. 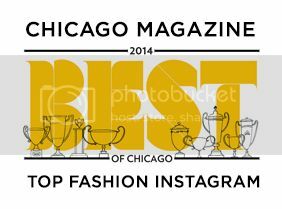 Shop Chicago men's shoes! Visit CITY SOLES in Wicker Park or shop online for European designer shoes and boots! Fashion designer sneakers with high heels inside are my favorite and wanted to buy shoes.